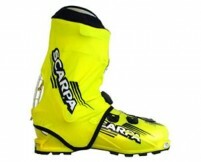 The SCARPA Alien Boots employ some radical technology to obtain a race weight at a reasonable price. With walkability similar to hiking boots and skiability similar to heavier kit, the Aliens are quickly becoming a go-to boot for skimo racers and light and fast tourers. SCARPA designed these with a more comfortable last than other lightweight boots, and used a BOA closure system instead of a buckle in the forefoot. This allows you to get a precise fit over your instep without consulting a boot doctor with a heat gun. The laced upper buckle system is integrated into the walk/ski mode switch so you can transition between uphill and downhill modes in one simple step. Once pointed downhill, the Alien Propulsion Tech frame provides a sturdy platform for driving skis harder than you would think for a 2 pound boot. Flexible waterproof sheathing around the ankle helps keep snow off the liner. A single-throw buckle so you can switch quickly between walk and ski modes. Adjustable forward lean allows you to choose your stance at either 9 or 13 degrees. Full 60 degree range of motion in walk mode lets you actually run uphill (or down if the need arises). Moldable Intuition liners (166g/5.9oz) wrap securely around your foot with a BOA closure system. Vibram "UFO" soles are the perfect ride for Aliens, providing 360 degrees of durable traction on sketchy terrain. Secure yet comfortable 99mm of forefoot last. Hi Matt, this boot is a 16/17 model. The Alien was discontinued in 17/18 in favor of the Alien RS. 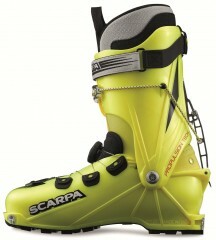 I have recently started using a pair of Scarpa Aliens (not Aliens 1.0) for backcountry skiing. In terms of uphill/downhill performance, I like them. My concern is for the grip factor of the soles. Compared to my previous boots, Garmont Masterlite, Dynafit TLT 4, they feel slippery on ice and firm snow. This is not too bothersome in midwinter as I have little need for transitioning to kicking steps or rocky summit scrambles. However, traverse and summit skiing season is approaching and I wonder if these boots are up to that kind of use. My question, do you have any familiarity with the "grip factor" of the soles on the Aliens? FWIW - I use crampons (boot and ski) and ice ax when needed. Obviously, I'd rather not be forced to use these tools on a regular basis. Thanks for any experience or thoughts you may have. Hi Bill, the Alien has a tried and true history as a ski mountaineering boot and is definitely up to the use you are proposing for it. The original intent, however, is as a skimo race boot which means that many of the features have in turn been trimmed to a minimum. The sole is known to be good, but it is not as thick or made of the same rubber that heavier boots are equipped with. In the end, the conditions and your personal confidence are the deciding factor for when you need to put the crampons on to ensure traction and safety. Are the Alien and Maestrale shell sizes significantly different? I understand from previous questions that the Alien runs slightly small. The reason that I ask is that I live in an area with little selection of AT boots to try on. I fit a size 26 in the Maestrale, but by chart size I should be a 26.5 (8.5 shoe size). Would I want to order a 27 Alien? Hey Bob! If you're a 26 Maestrale and wear an 8.5 shoe then you're almost definitely a 26 Alien as well! You may fit into the 27 but with the amount of different boots available on the market, sizing up to get a proper fit is a no-no. I realize the selection is a bit slim so taking that into consideration, I do have a La Sportiva Syborg in 26.0 if you're interested in this weight category of boots. I wear an 8.5 shoe and the 26.0 shell is plenty generous in terms of length. Thanks, Trace. That helps, sort of. I should have ordered first and asked questions later, as the size 26 Aliens are now gone! The Syborg sounds like a reasonable alternative, but I’m concerned about their durability. I need something in which durability will be as, or more, important as performance. I love the resources on this site, though. You guys clearly know your stuff. Can you guys explain why (according to the spec. sheet) the Alien, which is a cheaper boot is lighter than the new Alien RS? Does the RS just ski better or is more comfortable or both? Why would I want the heavier more expensive RS version? Thanks. Hi mckenna, this version of the Alien is being replaced by the RS. The RS does ski better and has improved sealing from the elements. Unfortunately that did add a bit of weight. For racing, this original might be better! I'm currently touring on 27.5 Maestrale RSs. Do you recommend sizing up to 28 for the Alien? Hi Rob, the 27.5 Maestrale shell is also the 28, so you're not even really sizing up. SCARPA uses the same length sizing across their boots for the most part, though the Aliens are a bit narrower. I guess I'll throw in my 2 cents even though this review will be moot after the new Aliens hit stores next season. My Aliens have seen near-daily use for 1.5 seasons and for the most part are still going strong. However, I ended up making a couple modification before I felt truly pleased with their performance. Most notably, I cut out the "baffle" to improve touring performance. Honestly the baffle is such a terrible solution to the problem of snow getting in your boots. I found it hindered my cuff articulation and reduced the enjoyment of skinning. 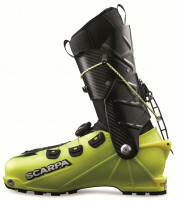 IMO Scarpa should just include a free pair of their gaiters with purchase of the boots. Do yourself another favor and ditch the power strap--another terrible design. I concur with previous reviewers pointing out the latch cord as a weak point in the boot's design. I've broken countless cords and sadly have yet to find a cord that lasts longer than 2 weeks or so. Be prepared and carry a couple extra cords. I've worn holes in the heels of 2 pairs of liners. This wouldn't hurt so much if they didn't cost over a quarter of the price of the boots. All this being said, I've been immensely pleased with their ability to tour AND ski. These are the only boots I own, so I ski them with race skis as well as touring skis (Dynafit Cho Oyu) and powder planks (La Sportiva Vapor Floats). Aliens x Cho Oyu has been a great combo. On the Vapor Floats they are admittedly a bit under-powered, but if you latch and cinch the boa tight, you can dance down the pow just fine. Hey Peter, thanks for the feedback. A cord should definitely last more than a few weeks. It's possibly you have a burr in the lever tunnel that might be fraying it. If so, a file will fix. I am wondering if there are any crampons capable of climbing WI2-easy WI4 for use in alpine climbing situations with the Scarpa Aliens? I have a pair of Cassin Blade Runner crampons that I use with mountain boots and I love 'em but they don't cinch tight on the Aliens. Intended usage would be east coast Mt. Washington/Katahdin gully climbing and skiing off. Potentially also some ski routes on Rainier and such. Hi John, consensus is the Grivel G20 with a CAMP toe bail. The CAMP bails seem to fit the most securely, while the G20 is nice and light. Do you sell the cuff to lower boot mounting bolts, both inner/outer? Hi Derek, the cuff nuts, washers and screws are available in our listing for boot parts. The parts are different for the 1.0 version versus the standard Alien, so note that each are listed separately in the drop list. I'd like to add two things to the above positive reviews, all of which I agree with. Durability. The cuff pivot on the Alien is user maintainable. This is a big improvement over boots with just a rivet in this location which just loosens over time introducing slop into your downhill mode. With access to the right equipment you can repress this rivet but that is a huge inconvenience compared to just using a few tools you already have on hand. Other important moving parts on the Alien are also field maintainable like the lock lever pivot. This is all really good stuff. The one durability question mark in my mind is the cord that is part of the cuff locking mechanism. I think carrying a spare is prudent but should say that mine has not broken and I see lots of racers with this boot and have not seen one sidelined by cord snappage. Probably an infrequent problem but one to be prepared for! Powder protection. My boots are the older model but I have seen the new version has full liner coverage which is pretty unique for a race boot. This makes it a great bet for all day use in fresh powder which can really pack in to more open boot shells like the PDG. Having only seen these I dont know if the extra coverage negatively impacts walk mode. Hopefully someone else can comment on that. Spot on about the cord locking mechanism being a weak link. I've personally sheared both of mine while post holing through mank and into talus. (Voile straps to the rescue!) Carrying backup cord, as well as voile straps for both boots is highly recommended if you are mountaineering with Aliens. As for the full liner coverage, it is actually an overlap that does not impede the walk mode. At least that I know of, as I've not owned the prior Alien w/o such liner. But I can't imagine it being too much different. I am looking to buy a pair of Aliens. I have tried on the Alien in Mondo 28 and it is about 3-4mm too short at the front – ie all 5 toes are touching the front of the liner and shell – a little too close for comfort. I have also tried on the Alien in 29 and it just feels a little bit too big. Essentially I am a 28.5 in the Alien which does not exist. Do you have any suggestions? Can I heat mould the 28 to make it bigger by 4mm, or should I put a thick insole in the 29 and wear a thicker sock. Or should I try a different boot altogether? Hi Joss, in general it's better to start small as a boot can be made bigger, but not smaller. It sounds like something a heat mold would fix. We're happy to walk you through a shell fit after you receive the boots, just give us a call. I got a pair of these to replace/upgrade from F1s. I have put circa 50 miles on these so far and can't get over how great they feel. The really do feel like running shoes. I also find they ski downhill surprisingly well. My only complaint is the power strap. When I am in uphill mode, the power strap slides up and over the cuff and rubs my shin. This is extremely annoying. Has anyone else had this problem? How do you prevent it, besides not having any tension on the power strap? Hi Danny, lots of folks just ditch the power straps. You could also affix something to the front of the shell to hold it in place. Some velcro or a simple rough surface may be enough. Question on sizing - I am currently in a size 26 /26.5 TLT5 Performance with a 287mm BSL. They fit great - for the Alien, should I size to 287mm (therefore a 27 mondo?) Thanks! Hi Aaron, the BSL is a poor indicator of internal length. If you aren't crammed into the TLT5s, you might fit in the 26 Aliens. Give us a ring to walk through a shell fit on your TLT5s. Will do, thanks. Although one other question, if my bindings aren't adjustable, do I need to stick to the BSL or re-drill? You can generally remount a whole size if the ski is reasonably reinforced in the mounting area. Using the same BSL is obviously easier, but note the Alien BSL is usually a bit less than advertised. Considering putting together a really light setup for both winter touring and spring ski mountaineering on PNW volcanoes. Focusing on the Alien due to to the vibram sole and a poor experience with the durability of Dynafits. 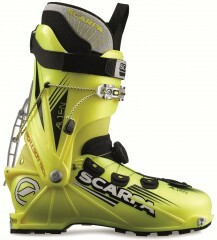 How does this boot pair with (relatively speaking) moderately-wide skis like the Cho Oyu or Response-X? If you typically ski something in the 180 range should you shorten up a length if using the Alien? 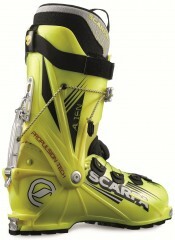 Any thoughts on an appropriate ski combo and what one might experience from a boot like this is much appreciated. 175lbs, 5' 11', not an overly aggressive skier. Hi SlabbyD, good questions. The answers are subjective of course, and it depends on whether you tend to use ski boots as a crutch and how much you drive a ski into turns. 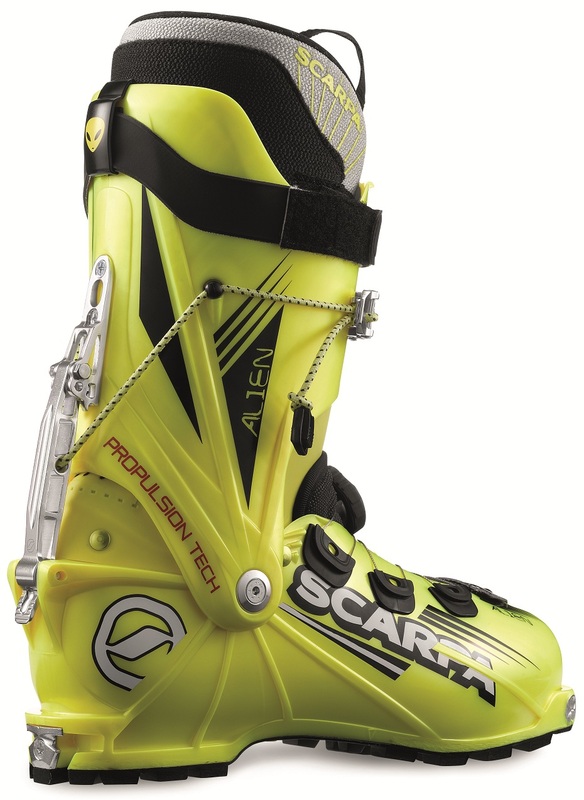 Your size and target skis are approaching, right near, or over the limit for these boots, depending on your style. The 1.0 version of the Alien can handle this with carbon reinforcements in the lower shell, but this one has a bit more flex. Shortening the ski can help in some circumstances. I am close in size and use both race boots and TLTs on a Response-X 177 in different situations, the latter in tougher conditions. Sizing question: I typically wear a 27 Scarpa TX pro Tele boot that fits well. US street shoe size 10. What size would you recommend? Can't wear too tight of ski boot due to bunion. Hi John, you are borderline and could probably get into the 27 with a little work. Mentioning you can't go tight makes me think 28 is the way to go though. Hi Nick, these run a little short so you will most likely need a 29. Question - I am looking for something to replace my now defunct F1 EVOs how do the Aliens compare in stiffness and fit? Hi Tolbert, I'd say the width is somewhat similar in those boots, despite being spec'd differently. The Aliens run a bit short so you may need to round up in size (they only come in whole sizes). The Alien 1.0 is stiffer than the EVO, the 0.0 is a little less stiff. The Skimo folks can help you find the right fit. Thanks Jason for the help! Now for critique...I should preface this with, "I'm 90% a Dynafit die hard." I chose the Alien because I needed a race boot to fit feet too big for the PDG/DyNA boot. I wear a 30 with just a touch of extra length in a Dynafit boot. If only Dynafit made race boots in a 30... Anyway, once tried, I fell in love with the Alien and am trying to convince myself I should get the carbon cuffed Alien now. I spent about 15-days on them last year, including some long races (Gothic and GT). They are durable, reliable, extremely light. They have a short sole length making them agile on boot climbs and easy into crampons. I prefer the locking lever on the back of Alien to the Dynafit buckle (TLT-5 is my main boot, similar top buckle to PDG boot). The BOA is low profile, doesn't hit rocks like a standard buckle sometimes does scrambling through exposed talus. The BOA requires occasional re-tensioning during the day/race--easy and quick. The Scarpa plastic is a little more scratch resistant than the TLT-5 plastic (different plastic in TLT-6) in the rocks. The Scarpa Alien size 30 is just a little shorter than a Dynafit 30; I had to dremmel out a little in front of Alien. The heal/ankle is wider on the Alien than all Dynafit and older Garmont boots I've used. For my boney heals and ankles, I'm still trying to put the right custom fit pad in place to reduce heal slip and race blisters. It will be well worth the effort of tinkering with custom fit. The liner is an excellent no non-sense race liner. I put a cork bed in mine, primarily in an attempt to pull my toes away from the end. I recommend customizing the power strap to prevent it from riding above the cuff and rubbing your shin...easily done with Velcro. Functionality is great. I thought the locking system looked weird and weak but it is actually very simple, smooth and strong. Not quite perfect, but best I've found... so I give 5 stars for price, weight, functionality, and lean! I was worried about the 4 or 5mm cord and locking device integrity before purchasing... guess what...? on top of Cayambe in Ecuador I went to lock my boot and snap (cord failed)! Luckily I had my ski strap and was aware enough to give it a try (black diamond)... I strapped it around my broken locking system and it held like a champ. Ended up being the best ski decent I've done. Anyhow, quick call to Scarpa and they sent the cord to me a few days later. Boot are light and stiff. Much better fit for me than TLT6 which I gave a go prior to the Aliens. I highly recommend for price, weight and comfort, but be sure to have a BD ski strap with you which I'm sure you will. I think you mean Skimo straps! I was wondering if anyone has any idea how the scarp alien fits in comparison to la sportiva. 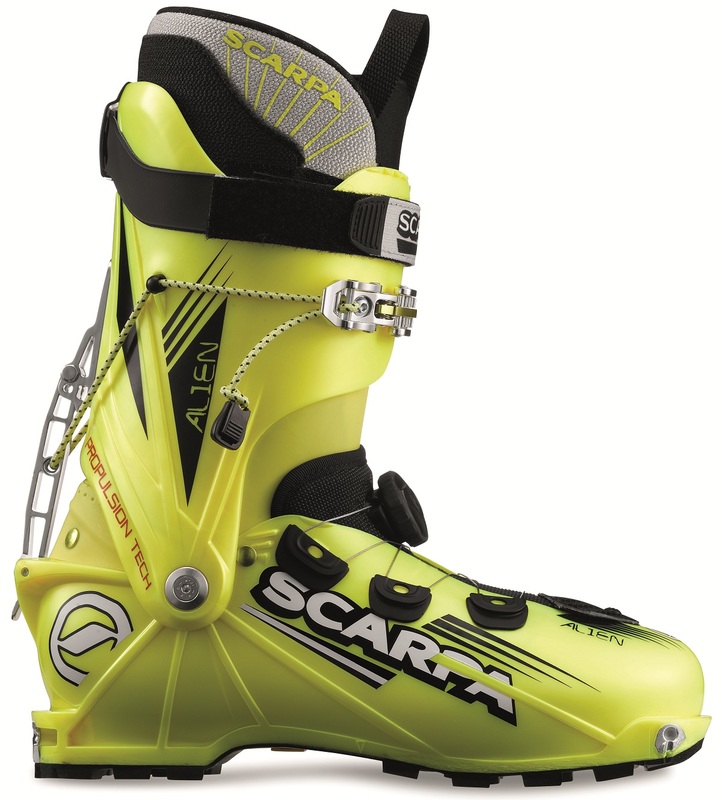 I use a la sportiva boot as my go to backcountry ski boot, but would love to get a pair of aliens for skimo. I am 27.5 in la sportiva. Should I be sizing up from that for Scarpa? I telemark ski on a Scarpa T1, but that boot is fitted really small for resort skiing (26.5). Any insight would be great. Thanks. Hi Scott. The Aliens run a bit short and also are slightly wider than the Spitfire/Sideral/Starlet. Most likely you would be a 28 in the Alien, which only comes in whole sizes. You might be able squeeze into the 27 with some punching, but it's nice to have room in the toes when striding. Nice light boot at a reasonable price. Reasonably stiff, but haven't skied the carbon 1.0 version. Great range of motion. BOA and cuff release work well.